Clarence Coles Phillips, better known as Coles Phillips, drew his way through a childhood devoid of formal art education. Phillips was unproductive when he worked as a clerk at the American Radiator Company and sketched on the job. He soon moved to Gambier, Ohio to attend Kenyon College, where his drawings were in high demand and adorned the pages of the college newspaper and yearbook. Phillips left Kenyon three years later to pursue a career in illustration in New York City, where he again worked for American Radiator. He was fired after a short tenure when the president of the company viewed a vulgar drawing Phillips had made of him. Phillips sought formal training by night at the Chase School of Art and the Free School. He endured a stint working at an illustration assembly line where several men painted different body parts on a single figure; he quit in disgust after just eight weeks. Phillips then landed a job at an advertising agency where he worked as a staff artist, and was quickly promoted to artist-client liaison—a higher-status job that prevented him from making his own drawings. Even after leaving the agency and starting his own in 1906, he was not painting as often as he wanted. Phillips gave up the agency the following year and with enough money for thirty days of food and rent, he started to work in earnest, drawing frantically day and night. Just as his money ran out and his landlord became restive, Phillips presented a drawing to the editor of Life magazine, and the editor approved. Phillips was paid for his work and illustrated for Life frequently from then on. His first Life cover appeared in early 1908. In May 1908, also on a Life cover, he pioneered what came to be his signature design—a graphic human figure with a detailed face, hands, and feet, and with clothing in the same shade as the background. This design, called “The Fadeaway Girl” took the illustration world by storm, and Phillips’ work soon appeared on books, calendars, postcards sold internationally, and a profusion of other covers for Life. Although he often created illustrations without the fade-away effect, the style was his unmistakable hallmark throughout his career. 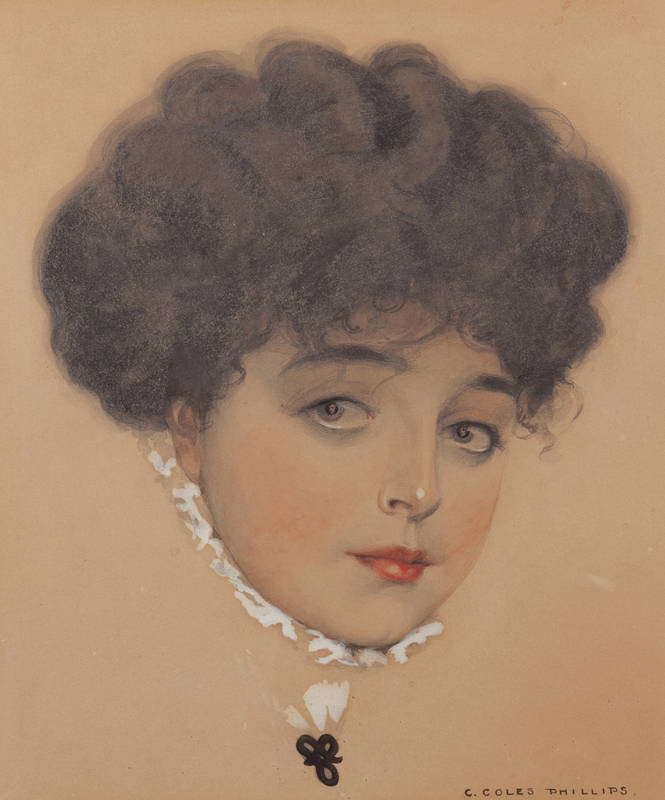 Phillips’ most celebrated works were for advertisements directed at women. His many illustrations for Holeproof Hosiery and his wildly popular “Miss Sunburn” illustration for Unguentine in 1924 reflected the changing fashions and values of an era in which femininity was in flux. However, the main distinguishing feature of his work was design, and his radical techniques set him apart from other illustrators far more than the substance of his paintings. Phillips grew eager to step outside the world of beautiful women in his work, but art directors had no interest in the paintings of animals or other subjects which he showed them. Kidney disease ended Phillips’ career in 1924, and although he planned a new phase of work from his sickbed and painted until his eyesight failed, he never illustrated again. Phillips died on June 13, 1927 at the age of 47. Bailey, Temple and Coles Phillips. The Dim Lantern. New York: Grosset & Dunlap, 1923. Ermoyan, Arpi. Famous American Illustrators. Edison, NJ: Chartwell Books, August 1, 2002. Kirby, Barbara Ann. Wall Art Made Easy: Ready to Frame Vintage Coles Phillips Prints. Self-Published, CreateSpace, June 5, 2017. Martignette, Charles G. The Great American Pin-Up. New York: Taschen, January 1, 1999. Phillips, Coles. A Gallery of Girls. New York: The Century Co., 1911. Schau, Michael. All-American Girl: The Art of Coles Phillips. New York: Watson-Guptill Publications, November 1, 1975.